Introducing air fry technology, New in the BLACK+DECKER extra wide crisp ‘N bake air fry toaster oven. This is deep fried taste without the fat! Air fry technology uses high intensity hot air to bake, Brown, and crisp your favorite fried foods with little to no oil. Try French fries, veggie chips, breaded fish filets, frozen snacks, and a lot more! The extra large capacity Fits food for the whole family. There’s space for up to eight slices of bread or a 12” pizza, and you can use the pans you already have! With room for a 9” x 13” pan with handles, you can go straight from oven to table. Three control knobs make it easy to set the toast timer and 60-minute timer, and choose from five cooking functions: bake, broil, toast, keep warm, and air fry. Convection technology circulates air within the oven for fast and even results when air frying. 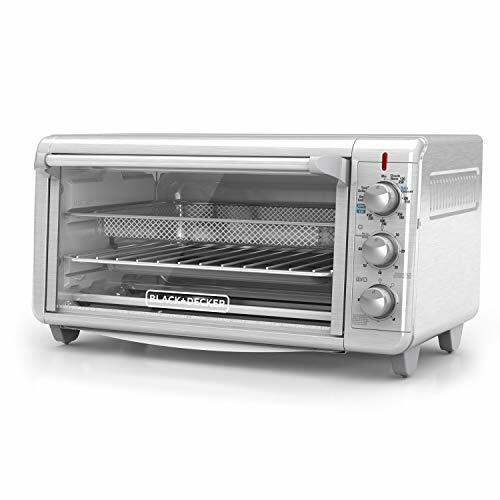 Plus, this toaster oven includes an air fry basket, bake/broil pan and rack, and an external crumb tray that slides in and out to make cleanup a breeze. 60-Minute timer – the 60-minute precision timer is convenient for short and long cooking tasks.